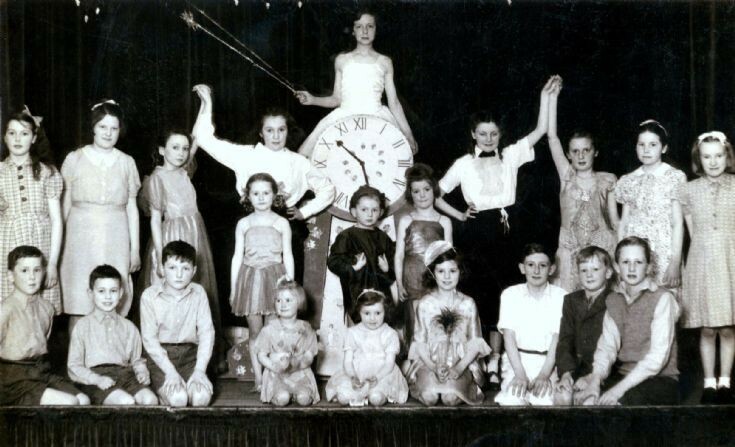 In the 1940s and 1950s the Vera School School of Dancing held weekly dancing classes in the Handcross Parish Hall and put on an annual show. The weekly fee was 6d (2½ p) and was certainly popular with the parents, but, from the expressions on the faces of the children, I suspect many would rather be elsewhere! Back row:- Joan Miller?, Shirley Wheatland, Eleanor Allam, Pam Streeter, Doreen Rye, Janet Boxall, Jill Jenner, Janet Ellis. Middle row:- Sally Ray, Barry Ray, Janet Peskett. Front row:- Ralph Bosley, John Baldock?, Gerald Cosens, Brenda Peskett, Yvonne Newman, Daphne Mitchell, Ivor Verlander, Nicholas Boakes, Rex Tester. Sally Chamberlain was also mentioned in the newspaper cutting and probably featured on one of the other dances. Click on Open Document to view the newspaper cutting entitled “Dancing Display by Handcross Pupils”, and Large Version for a close up. Two newspaper cuttings have been added to the "document" above. The first is another report on the production featured in the above photograph, and the second covers another concert put on by the dancing school. I cannot find a photograph relating to the latter. That's a blast from the past, remember doing some of this but never seen a photo!